Many benefits of chess for kids remain unique and valuable. While playing hands-on, collaborating as a team, children exercise problem solving and planning, concentration and creativity, memory and willpower. Chess can be an excellent introduction or a compliment to math and logic games, computers and programming, history, social studies, and more. "Chess Is Child's Play" by Laura Sherman is a great book for parents and teachers. Even if it is a parent like me who don't know or remember much about the game of chess, this book makes it possible to introduce kids to the game and have fun playing starting from the very first lessons. The authors give age specific recommendations that make possible to discover chess as early as age 3. 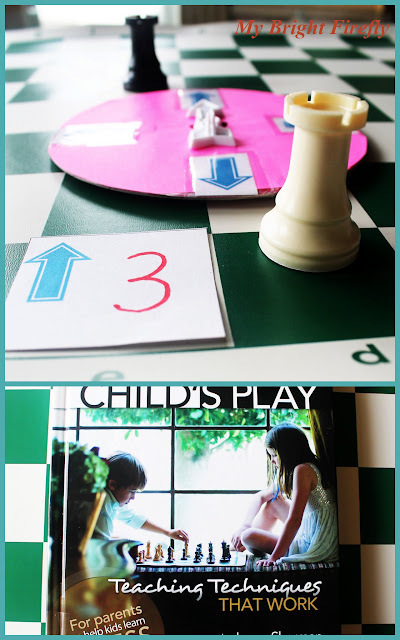 The book is very easy to follow and provides helpful tips for playing chess with kids. It starts with describing many benefits of playing chess for kids and tips on how to choose a chess set. The explanations of the rules, descriptions of the little games, and tips for educators are provided in each chapter. Did you know that Armenia was the first country to include Chess as a required class for elementary school in 2011? We started our chess games with the rook. It's a simple and fun "character" that looks like a castle built in a corner of the "magic kingdom". The rook moves simply forward, backward, right, and left. That is easy for adults. For little kids, this is an opportunity to learn the directions through play, to recognize rows and horizontal and vertical lines, and a great introduction to a computer algorithm. What Is a Computer Algorithm from How Stuff Works. a marker to write a number. We positioned the rooks in the opposite corners on the board. The goal is to provide the white rook with a set of commands to walk him through the maze and meet his friend, the black rook. 1. Rotate the spinner to determine the direction: forward, backward, right, or left. 2. Take a note card and position it with the arrow pointing in the desired direction. 3. Throw the dice to determine the number of steps, write the number on the card. 4. Place the card at the starting point on the board, let the rook follow the command written to proceed through the maze. 5. Fill next note cards the same. When our maze started looking messy with several cards on the board, but the white rook was not getting to his friend yet, we started using the dice only, or the spinner only - filling the direction or the number of steps as we found better to finish building the maze. The Maze to Black Rook Algorithm! With all the fun, we didn't noticed that we practiced counting, problem solving, learned directions and following instructions. Love this!